Travis Tritt brought an old school country feel to the historic Imperial Theatre in Augusta, GA on Saturday night in front of a sold out crowd. It was billed as a solo acoustic evening with the country superstar, who was dressed in black leather pants and a tan sparkly jacket. He sat in the middle of the stage on a stool with an acoustic guitar. 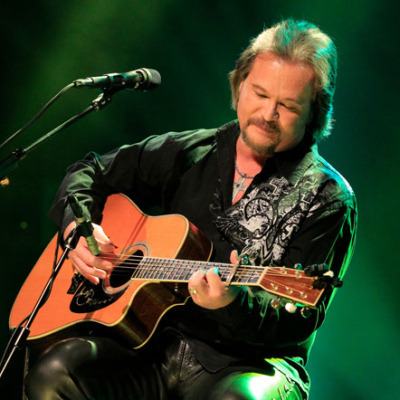 The acoustics of the intimate venue helped provide a crisp sound for Tritt’s performance. “Thank you for having me here. It’s wonderful to back in my home state,” Tritt said and continued, “I’m gonna play a whole bunch of really good music for you tonight. I came down here to party with y’all.” He added that he had only one rule – if you’re going to sing along…sing good. He performed a song originally written by Tom Petty, “Southern Accents.” He would later cover “Help” by The Beatles in his own unique way. He mentioned that his first single, “Country Club,” came out in 1989. It was the biggest selling single at Warner Brothers country in Nashville at the time. While performing this song, Tritt got up off the stool and kicked along with the music. He even encouraged an audience sing-along. Whenever Tritt would solo, he would raise his guitar high up and look down – away from the fret board, almost closing his eyes. This shows that he is a master of the guitar – to still be able to play perfectly while not looking at his rapid finger movements. During “Here’s A Quarter (Call Someone Who Cares).” Tritt snuck in an updated verse that contained “iPhone” in it – to modernize the song. During “The Whiskey Ain’t Workin,” Tritt once again got up off the stool and swung his hips as the women in the audience screamed in delight. Tritt is part of the country “Class of ’89,” which also includes Alan Jackson, Garth Brooks and Clint Black. Tritt keeps the memory of traditional country alive, making Johnny Cash and Waylon Jenning proud. Just as Tritt said, he had influences with country and Southern rock like Lynyrd Skynyrd, Allman Brothers and The Marshall Tucker Band. And that created a unique style to help Tritt rise to the top. It was a perfect night. The sound was perfect. The performance was perfect. Everything was perfect. The two-hour show was very entertaining. The storyteller approach made the evening even more special. Tritt felt very comfortable in his home state of Georgia. Maybe next time Tritt will bring the whole band to town and turn the twang up.